Russell & Ballard stocks a unique selection of high quality jewelry at very competitive prices. The Russell & Ballard staff attends multiple national jewelry shows to find the right mix of quality and style fitting the needs of West Michigan. The selection is distinctive to our store and 90 percent of our inventory can not be found in mall stores. These items we carry are not mass produced and we do not overstock. In addition, we offer custom designed jewelry, which can be more affordable than you think. No matter what your price range, we’ll find something to fit your needs.Browse through our galleries and feel free to contact us with any questions. Then, stop in to see us, so our expert staff can assist you with your final choice. When it comes to your special day, you want everything to be perfect. Why not start it off right with the perfect engagement ring and seal the deal with the right wedding band. We also offer over 60 years of expertise and can help walk you through the diamond selection process and provide you with the diamond education that you need to make the right choice. Select silver or gold and give the gift of classic beauty. 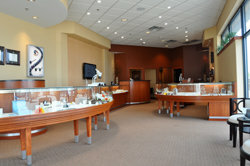 Russell & Ballard has a large selection of classic and modern silver or gold jewelry. Want a sophisticated, elegant design? Russell & Ballard carries a multitude of settings and designs incorporating gemstones and pearls. These stones, with the right setting, can compliment any style. Watches are not only for telling time, they give you the opportunity to express your style in a functional manner. Let your creative side shine by letting us help you design the perfect piece of jewelry for that special someone. Russell & Ballard carries the ever popular Tervis Tumblers. Keep your cold drinks cold and your hot drinks hot with these personalized cups and mugs.